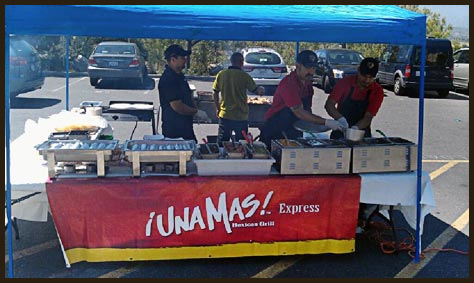 Unamas partners with Valley Christian School as they sell food to raise money!! Raising funds for your school program or event has never been so delicious, healthy, and EASY!! This year, skip on buying the candy bars, wrapping paper, or coupon books… instead, cater a school event or have a “school night” at your local Una Mas Mexican Grill. Una Mas has a unique program where fundraising efforts for schools take center stage. Complete the form below to learn more about two distinct ways to raise money. Your school can host a night at a specific Una Mas location…or have Una Mas bring our delicious food right to your campus! Either way, 20% of the proceeds from these events go directly to your school!!! The proceeds could help pay for educational supplies, music programs, needed books, equipment, after school programs, anything. Complete the form below now to learn more about this fun and easy way to raise money for your school this year!! If you would like to hear more information or plan your catered school event fill out the form below or call us today! Cater your school event today! Please fill out this form and we will get in touch with you in the next 24 hours.